A Helmet For Your Protection! When a tooth has fractured substantially, has had a number of large fillings or is showing crack lines, it may be appropriate to restore it with a crown. Crowns are used when there is not enough good tooth structure remaining to support a filling. A crown is commonly called a cap. As a cap fits over your head, you can think of a crown as a helmet for your tooth. Unlike a cap though, a crown will offer your tooth some added protection. The crown covers all surfaces of the tooth it restores, providing full 360 degree coverage around the tooth just like the metal rings that hold the wooden planks on a wine barrel together. This makes the damaged tooth strong again and offers protection when chewing and prevention from fracturing. Some patients come in after years of getting fillings and we find that we can no longer replace the filling. Fillings are used to prevent tooth decay but if they are not maintained, or if they are not set correctly, tooth decay will continue. When tooth decay gets significant it must be removed and this can cause the structure of the tooth to be unable to support further fillings. Crowns are the next step, and although you will be losing a little tooth structure to have room to fit the crown, you will be restoring your dental health. What Kind Of Helmet Do You Need? In short, you need a helmet that will restore the same protection that your natural tooth used to have. What you decide this helmet should be made of is entirely up to you. As your dentist, it is our job to cap your teeth with care and have them returned to good working order. In the past crowns were made from metals such as gold for strength. However much like amalgam fillings, this has happened less and less due to the metals not being an aesthetic fit. To correct this, a layer of porcelain can be added onto the metal crown to form what is commonly known as a veneered crown. This type of crown combines the strength of underlying metal with the tooth like aesthetic of porcelain. There is always a small risk of porcelain fracturing away from the metal so quality dentistry is required as well as regular maintenance. We also now have access to newer technology that allows us to create a crown with no metal at all. These crowns are commonly referred to as all-ceramic crowns or all-porcelain crowns. In the past this option was really only suitable for front teeth where the aesthetic demands of patients are extremely important but strength is not so important. That is because porcelain is of course weaker than metal. We now have new high strength porcelains such as alumina and zirconia which have allowed us to develop all-ceramic crowns that are both strong and aesthetic. However, there is a slight compromise in aesthetics with these materials, resulting in crowns that look a little more opaque than what a real tooth should look like. Currently, all-ceramic crowns made with Lithium Disilicate such as e.max provide the best of both worlds with great aesthetics combined with strength suitable in both front and back teeth areas. We’ll go over all your options when you come in. A Fit For A King Or Queen! Are You Part Of The Royal Family? Crowns are one of the last resorts a dentist should use for your teeth. 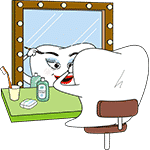 If you’ve been getting regular checkups then tooth decay would have been noticed long ago and teeth cleaning and fillings should have prevented severe tooth decay that caused you to need a crown. However, sometimes life doesn’t allow us regular checkups or things just didn’t quite work out and your tooth decay has become significant or your tooth has simply broken. Worry not because a dental crown is the royal solution to your dental health. A crown will prevent further tooth decay and all existing decay will be removed. You can treat a crown just like a normal tooth that hasn’t had any dental work. It is very strong, so you don’t have to fear using the tooth when you eat anymore. Just like all your other teeth, it is important to keep up with regular checkups and cleaning and have good oral hygiene in order to maintain that crown for the long term. If you are overwhelmed by the choices you have for crowns, or not sure if you need any then please come in for a consultation with one of our dentists who will be happy to assist you and advise you. Can You Still Have Problems With A Tooth That Has Had A Dental Crown? Once your tooth gets a dental crown, it can be thought of as a normal intact tooth again. The dental crown replaces the enamel layer of the tooth and protects the tooth like a helmet protects your head. In many cases, there may be a dental filling under the dental crown which helps support it, but the rest of the tooth is still untreated. When there are dental crown problems, they can usually be treated in a similar fashion as a regular tooth. If a little bit of porcelain material chips away from the dental crown, it can be repaired with a dental filling. This is often termed a crown tooth repair. The nerve of the crown tooth is often still alive and any further trauma to the tooth can cause it to react or die and cause pain, just like any other regular tooth. If a crown tooth has pain, it can be treated in the same way as a tooth that doesn’t have a dental crown. If the crown tooth has sensitivity due to gum recession next to the crown margin, this can be covered with a dental filling. If the tooth needs a root canal treatment, a small access can be made through the dental crown for the treatment and then a dental filling placed over the access to repair it. The dental crown procedure involves preparing the outer surface of the tooth for the crown to sit on and taking a mould of that to give to the dental technician to make the crown in the dental laboratory. A temporary crown covers the tooth until the permanent crown is ready and they are swapped over. Our dental crowns are made in Australia by a local dental technician who has a dental laboratory in the Brisbane city five minutes from our Brisbane CBD dental clinic. You don’t have to worry about getting a cheap dental crown made in China when you come and see one of our Brisbane CBD dentists.